I must admit I have been very late getting into chia seeds. That was until I found a local shop where I could buy them so I instantly stocked up. I have been adding them to my smoothies and juice but also making delicious breakfasts such as this one. It is so simple and easy to make, it is also great to make the night before if you have to rush to get out of the door in a morning. I don’t add any sweetness to this as I think the fruit adds enough but if you would like it to be sweeter 2 teaspoons of maple syrup would work perfectly too. I make this version using coconut yogurt mixed with either plant based milk or coconut water. My favourite coconut yogurt to make this with is Co Yo. Their yogurts are incredible, so rich and creamy. I used the plain in this recipe but any of the other flavours would be great too. Suggested toppings, fresh blueberries, kiwi, mango, apricots. 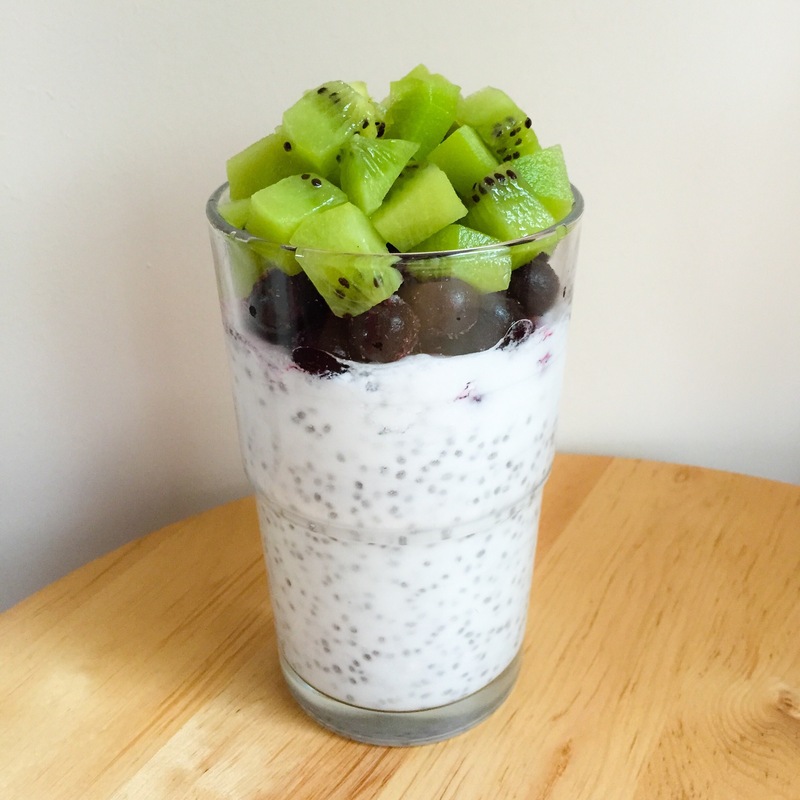 Mix the yogurt with the milk or water and vanilla, add the chia seeds and leave for 30 minutes or overnight. Place your toppings on top! So funny, I just barely tried chia seeds for the first time last week too! And now I’m hooked. I’ll have to give this version a try! Wow wow wow! I love the addition of kiwi on top. One of my all time favorite fruits! Wow this sounds wonderful! Thanks for posting. Hello from Fat Tuesday. Hey Hermione! I still haven’t ventured into chia territory… I’m still working up the courage. Thanks for linking up on Tuesday!